ALLEN PARK — Matt Patricia worked in relative obscurity in New England. The burly man with a bushy beard, baseball cap on backward, with a pencil above his right ear was noticed only occasionally while coordinating the Patriots’ defense. 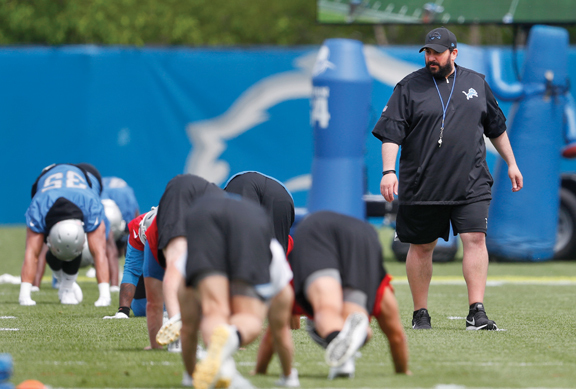 As a first-year NFL head coach with the Detroit Lions, his every move and word have been watched and listened to while reporters have had access to him and his team during minicamp and offseason workouts. Patricia’s past has also been scrutinized. What does Patricia know about the job now that he didn’t know a few months ago? A Detroit News report last month shed light on allegations against Patricia from 1996, when he and a friend were indicted 22 years ago by a Texas grand jury on one count each of aggravated sexual assault. The accuser did not testify and the case was dismissed. Patricia has said he was falsely accused. The Lions have said a pre-employment background check did not reveal the incident, adding they are standing by Patricia. The NFL determined allegations against Patricia are not subject to its personal conduct policy. While not referring specifically to the fallout from the allegations, Patricia acknowledged his job description includes more than Xs and Os on the football field. The Lions are making adjustments, too, under Patricia after practicing and playing for Jim Caldwell the previous four seasons. “He’s a guy that’s going to push you and try to get the best out of you every day,” cornerback Nevin Lawson said. Patricia lashed out at his players last week, screaming for them to move faster from one drill to another with words not fit to print even if team policy allowed it. Caldwell wasn’t heard yelling at players when the media was around and players didn’t hear him use profanity even privately. Return specialist Jamal Agnew was one of the many players who mentioned, “high expectations,” when asked about Patricia.